Don't miss your chance at these exciting fisheries! 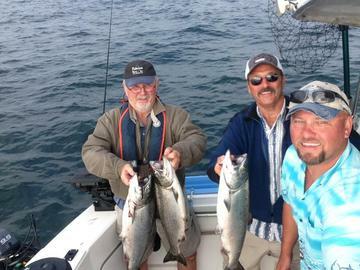 Come join us for an enjoyable day of fishing on the beautiful Puget Sound! Our stable 28' Uniflite Salty Dog boat with an 11' wide beam is equipped with state-of-the-art electronics, a marine head (toilet), diesel heater, on deck cooler with ice, and electric downriggers. The "DOGHOUSE" is a Coast Guard licensed and insured vessel for 6 people. However, we try to limit our charters 4 people for convenience and comfort. While there are numerous methods for catching salmon, our preferred method is downrigging. This technology allows for the use of lighter gear to further intensify the fighting feeling of the fish, and therefore enhancing the salmon fishing experience. Since no one can guanantee fish, Northwest Fishing Charters can guarantee that we will try our hardest to ensure your trip is memorable.